All season long, the Cardinals have celebrated the last year of the current Busch Stadium. The new Busch Stadium has a significant overlap with the existing stadium, so the current ballpark has to be demolished in order to complete construction on the new park. 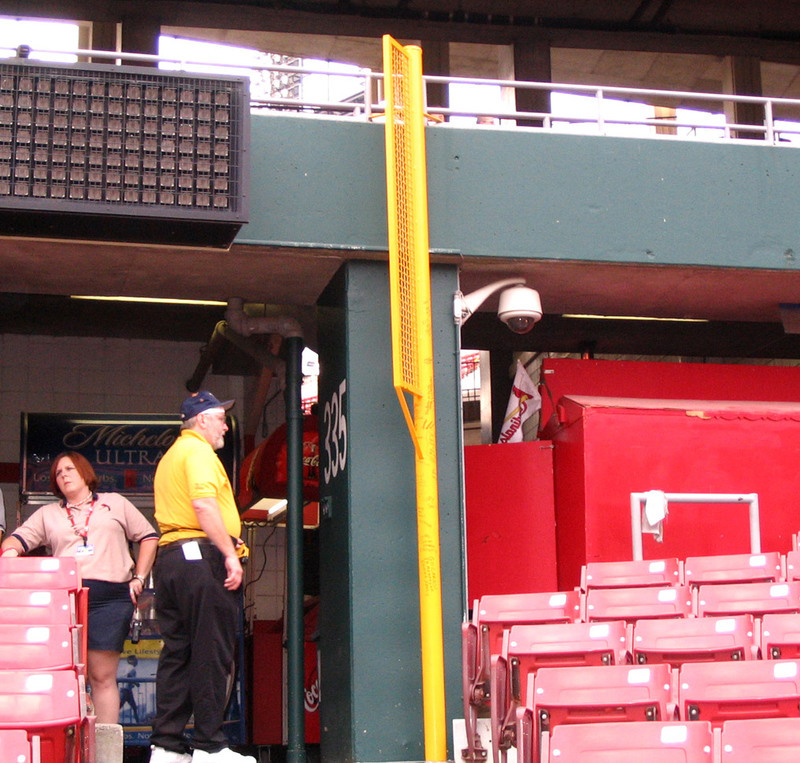 One indication of just how much the two stadiums overlap can be seen by the mini foul pole found in section 129. This smaller version of a foul pole represents where the left-field foul pole will be in the new stadium. The pole also comes complete with the distance (335) and the white foul line, painted on the concrete of the current Busch Stadium until it comes to the end of the sidewalk overlooking the new park. … the young gun you covered back in the day is now long since retired, and his son you used to see as a toddler playing around the pool at Spring Training is almost as big as Albert Pujols. That would be Andy Benes and Drew Benes, respectively. Dad, who finished his baseball career with the Cardinals after starting it with the Padres, has been down on the field during the playoffs, doing analysis for the local FSN channel. The 6-foot-6 right-hander used to borrow the Walter Johnson nickname "Big Train" for his size, and when he stands next to Pujols, he makes the Cardinals superstar slugger look a little more human than he did on that monster shot the other night. Fans have called all day wondering if they can get in after the seventh inning. There is a St. Louis Blues hockey game, so they’re thinking baseball-hockey doubleheader. But with the stands expected to be packed, the gates will not be opened. Some fans could have the compulsion to get that special memory by running onto the field. Not only will it get them arrested, but ushers and security are keeping a special watch. If the Cardinals lose — the lead usher said it won’t happen — all employees have to remain in place while a video tribute to Busch Stadium is shown on the video screen. Every media outlet is trying for any possible angle, any possible interview, at this time of year. That, of course, includes the Spanish-language reporters, who have a slightly more limited pool of athletes than those of us who write and report in English. Let’s face it, baseball is based on superstitions. Players will do anything to keep the good times rolling, from wearing their underwear backward on game days to eating the same pregame meal to not changing their socks during a hitting streak. Some players think that the day they show up a pitcher by standing at home plate watching a home run is the day they’ll break their leg sliding into second. Don’t mess with the baseball gods, one veteran player told me long ago. Remember Jose Lima‘s antics on the mound during his 21-win season in 1999? He sang, he danced, he celebrated a strikeout with the electric slide. The next year, he couldn’t get anyone out. At all. In 2001, he was traded to Detroit, home of the furthest fences in the bigs. Couldn’t get anyone out there, either. Why? As the veteran said, maybe it was the baseball gods. Show up the other team, lose the strikezone. Forever. So why in the world are players taking curtain calls? Reggie Sanders hit a two-run homer in Game 1 of the NLCS and popped out of the dugout for a curtain call. IT WAS THE FIRST INNING! Yeah, yeah, I know, it’s become somewhat of a harmless Cardinals tradition, and I can appreciate that. But in a 2-0 game, with eight innings to play? Come on. Lance Berkman pops a three-run homer in the seventh inning of Game 5, and soon he pops out of the dugout for a curtain call. An hour later, Albert Pujols jacked a three-run shot of his own to win the game. Yikes. And how about Sanders? In Game 2, he nearly broke his neck trying to make a heroic catch in left field. He had to leave the game, couldn’t play the next day, and since then, he’s had one hit. Look at Albert Pujols, and you think superhero. Look at David Eckstein, and you think supermarket, as in this guy could be stocking the shelves or shopping in the produce department next to you. But Eckstein’s some kind of athlete and some kind of baseball player, don’t let the appearances fool you. He has tremendous field savvy, and as we saw with that single in Houston the other night, a real knack for being calm in the clutch. Remember, that Pujols blast doesn’t happen without Eck’s two-strike dribbler. Besides, he really has the right attitude, and handles himself with extreme focus on the field and total professionalism with the media and with fans. The guy has fun playing ball, and you can see that from the time he steps on the field. Nobody has more fun playing catch than this guy, whether it’s with double-play partner Mark Grudzielanek or, like during Tuesday’s workout, with his brother, Rick, who’s a coach in the Nationals organization but along for this postseason ride with David. There’s the standard toss from 60 feet or so like everyone else does, but then Eck breaks it out all the way down the line. The other day in Houston, he went all the way to the left-field corner, and with the fan-packed stands jutting out, media all over the place on the field and a boom microphone as a target for Grudzielanek, the two played catch like kids in a park. High arching throws, perfect strikes every time. Fun stuff. It’s been 13 years since the same two National League teams played each other in back-to-back postseasons, and the current St. Louis-Houston rivalry is beginning to have an eerie tone to it. Remember those great seven-game Atlanta-Pittsburgh tussles of 1991 and 1992? Barry Bonds didn’t hit much in either of them for the Bucs. But the Pirates had a 3-2 lead in the 1991 series heading back home into old Three Rivers Stadium and never scored another run. Steve Avery threw eight innings of three-hit ball to win Game 6, 1-0, and John Smoltz tossed a complete-game six-hitter to win Game 7, 4-0, and the series. In 1992, the Braves actually led, 3-1, but the Pirates came back to tie with a blowout in Game 6 at Atlanta-Fulton County Stadium. In Game 7, the Pirates had a 2-0 lead heading into the bottom of the ninth when the Braves struck back with three runs. The series was decided with two out against reliever Stan Belinda when Francisco Cabrera singled home David Justice and Sid Bream, who came barreling around from second base and just beat the throw from Bonds, the left fielder. Cabrera only played parts of five big-league seasons and had 351 regular season at-bats. But his moment is one of the great ones in postseason history. And these are the memories that great playoff games make. The fact is that only three times have the same NL teams played against each other in back-to-back postseasons since the advent of the League Championship Series in 1969. The Dodgers and Phillies battled in 1977 and 1978 and the Dodgers won both times. The Braves and Pirates we’ve already documented. Now the Cardinals have a chance to repeat history by winning the final two games at home against the Astros in the second consecutive NLCS. Yes, the Houston Astros have a chance to make their first World Series appearance, but I’ve already witnessed history. Actor/singer Carol Woods was rolling through a rousing, gospel-fired rendition of "The Star-Spangled Banner" when she lost her place. And who can blame her? Yes, she’s been on Broadway, stage, film and TV. But none of that is at Minute Maid Park, with thousands of folks on edge already. You try hitting all those notes and keeping the ramparts, bombs and rockets straight.